I hope you've had a fun Sunday! a local dim sum restaurant it was yummy! Made even tastier as they always send us a money off voucher to use! Here's the little card I made today! The colours were very difficult to capture so I apologise for that! 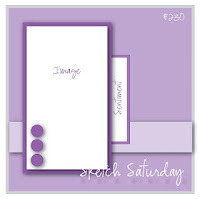 I used the sketch from Sketch Saturday for the design. I also added the blow & a Hope Ribbon Charm. crafty bits in but I haven't seen any for ages! Thanks for stopping by, I hope you like her! I'm off to search for a few more challenges to enter. Beautifully done Dawn! Your coloring on this image is perfect ... as is the message! Thanks so much for joining us at The Sisterhood ‘GET WELL’ challenge and please come back again soon! Lovely card Dawn. I especially like the hot pink you used to compliment the sweet image! this is gorgeous Dawn, I love the image and your colouring is beautiful. A lovely looking card. Sweet. Thanks for joining us in our charming challenge over at the paper shelter this week. Wonderful Card! Thanks so much for Joining us at Sweet Pea Stampers this month. Great use of the SSD image, Dawn (don't you just love her? ), and I love that ribbon charm! Marvelous. Great job coloring the image! The little ribbon charm is a perfect finishing touch. Thanks so much for playing along in the Sweet 'n Sassy Digi Challenge this week. This is wonderful! Love the sweet image! Cute!!!! Thank you so much for playing with us at Sweet Pea Stampers.